We lost our beloved Elle to greyhound diabetes. Here is Elle’s story. When we adopted Elle her previous people told us that when she was younger she developed a problem with her immune system. She lost a large percentage of her body weight. Their Vet did a series of tests to isolate the problem but could not come up with anything specific. They fed Elle with a turkey baster, tried immune building supplements and she began to rally. Soon she was back to being her goofy little self. Then she visited our greyhound home and met the love of her life—Murphy. Elle took one look at this tall, dark, handsome boy and she was smitten. Her tail began to swing back and forth like a pendulum and she batted her eyes—such a little hussy. She would stand next to him reach up and kiss his face. The feeling was mutual for Murphy and when her people moved to Arizona they felt it would be in her best interest if Elle stayed with Murphy. No one wanted to take a chance of compromising her delicate immune system by taking her away from this comfort zone. We loved her too and did not hesitate to say yes. Elle was happy to stay with us. When her “other Mom” came back for a visit the following year we held our breath, afraid that Elle would think that she was going back home with her. But when Murphy walked down the hall to go to bed Miss Elle followed without so much as a backward glance. We looked at each other and knew that Elle had made her choice. For the next few years Elle and The Beer Boys vacationed, walked and played together as one big happy family with no signs of greyhound diabetes. The day Killian was about to cross the Rainbow Bridge I was sitting on the floor telling him that we were taking him to see Dr. Rob and all his pain would be gone. The tears were streaming down my cheeks and suddenly from behind me Miss Elle put her head on my shoulder and licked the tears from my cheeks. Nothing or no one could have given me more comfort that day. Six months after Killian left us we were forced to make the same decision for Murphy. Elle was distraught—she would not look at me and for three days she would not come out of our bedroom. She finally began to eat but she was just not herself. Then Mr. T came into her life—she was again in love and Mr. T was very enamored of her. He did not take Murphy’s PLACE but he did fill Murphy’s SPACE in her life. Around Elle’s twelfth birthday I noticed she was loosing weight. She began to slow down but I thought it was just her age catching up with her. Then I noticed that she could not pass a water bowl without draining it. I suspected greyhound diabetes and called our Vet. Sure enough she had a sky high glucose level. We immediately began insulin and monitoring her urine. We got special high fiber food and I gave her injections twice a day. Mr. T would stay by her side snuggling her and giving her little kisses. But even with all this love and care little Elle did not have a strong enough immune system and she crossed the Rainbow Bridge to be with Murphy. 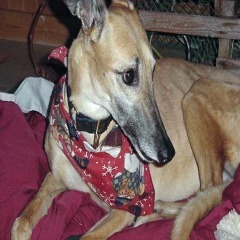 Greyhound diabetes is not uncommon it can be caused by diseases that affect the pancreas. Being overweight is also a contributing factor in this disease. If you suspect diabetes see your Vet right away, the sooner you can get it under control the better and happier you will all be. Take your pet to the Vet and have them tested for canine diabetes.